Your worst plumbing nightmare: After finally succumbing to the alarm clock, you get up and go to take a shower. There is no hot water. As you walk down into the basement, your slippers start to get waterlogged– your basement is flooded! A small leak in your water heater has turned into a flood. After leaking all night while you slept, the basement is covered in water and everything stored down there is wet. Want to avoid this nightmare turning into a reality? 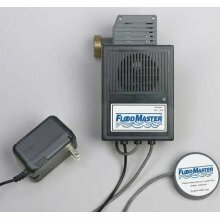 Consider a Floodmaster for your water heater. These are units that will automatically stop the feed of water to your water heater if they detect a leak. This could mean the difference between a small puddle of water when a water heater leaks or a full on flood. This type of unit is also available for washing machines, and Baker Elman can help you with your decision to explore either one (or both!) of these products.